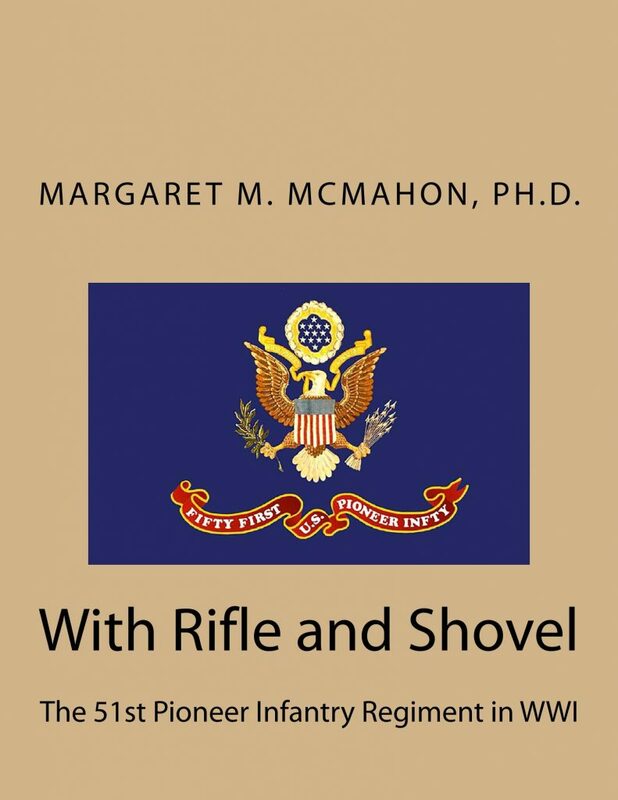 Welcome to the website for the books “Researching Your U.S. WWI Army Ancestors”, “A Week of Genealogy”, “A Weekend of Genealogy” and the lectures of Margaret M. McMahon. Have you been looking for how-to genealogy books to get you started and keep you going? These books have material for experienced as well as beginning family historians. Read about the topics that are covered in each book below. Each topic includes an introduction to using the records, how to find them online, and includes search terms to use and find more. You can view the Table of Contents for each book here. If you been looking for a speaker for your society or group, look no farther! You can check out reviews of Dr. McMahon’s books and talks here. When you need a little detailed help to research your family history, check out the tutorials. For reviews of the First Editions of the books check here. Your WWI Ancestors want to be found! Are you ready to research your U.S. WWI Army Ancestor? Are you wondering how to get started? With the approaching centennial of the United States’ involvement in the War to End All Wars (World War I), our thoughts turn to those ancestors who defended our freedom. This book will show you how to learn about the military service of your U.S. Army ancestors using archives, online resources, social networking and other resources. Learn ways to share what you learn to with others. 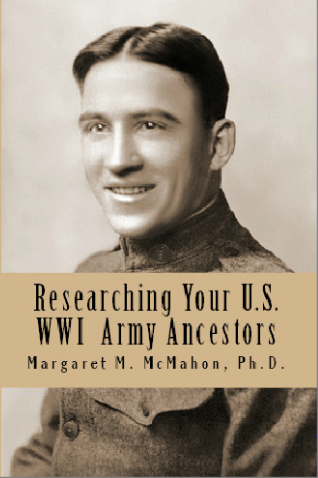 “Researching Your U.S. WWI Army Ancestors” can be purchased through Amazon online. The men of the 51st Pioneer Infantry were mostly draftees. While other soldiers fought with rifles, they used shovels. They also saw combat. As shells went off around them, the pioneers filled holes with rubble collected from destroyed villages. Those roads were the battlefield lifeline, allowing troops and supplies to move forward, while ambulances took the wounded back to hospitals. They cleared the roads that had been booby-trapped by the retreating German Army. They marched at night to hide from the enemy. After the Armistice, they marched into Germany to be part of the Army of Occupation. The Pioneer Infantry provided labor where ever and when ever needed, including guarding railways and bridges, and burying the dead. This book combines information found in archives and a variety of other sources. The material has been blended into a new product that tells the story of the 51st Pioneer Infantry Regiment. It is intended to be both a narrative and a reference for those researching this Regiment. “A Weekend of Genealogy” offers a weekend of genealogical research activities centered on the U.S. Federal Census and Internet searches. The book includes how to find the census records for your ancestors and what to do with them. It demonstrates how to build Google searches to hunt for your family’s history. It also acquaints you with other Internet search engines. There are activities you can do before and after the weekend. The book contains hints, websites, and search terms useful for your own research. Get ready to spend a weekend hunting for your ancestors using the records and techniques described in the book! “A Week of Genealogy” focuses on seven days genealogical research activities. Activities before and after the week are also included. The book includes hints, web sites, and search terms useful for each day’s activity. 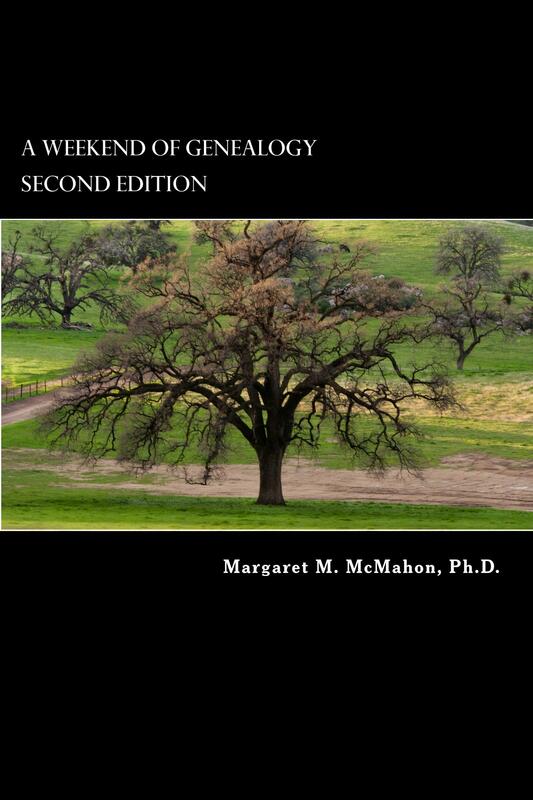 “A Week of Genealogy” has been written to complement Dr. McMahon’s popular classes and lectures. 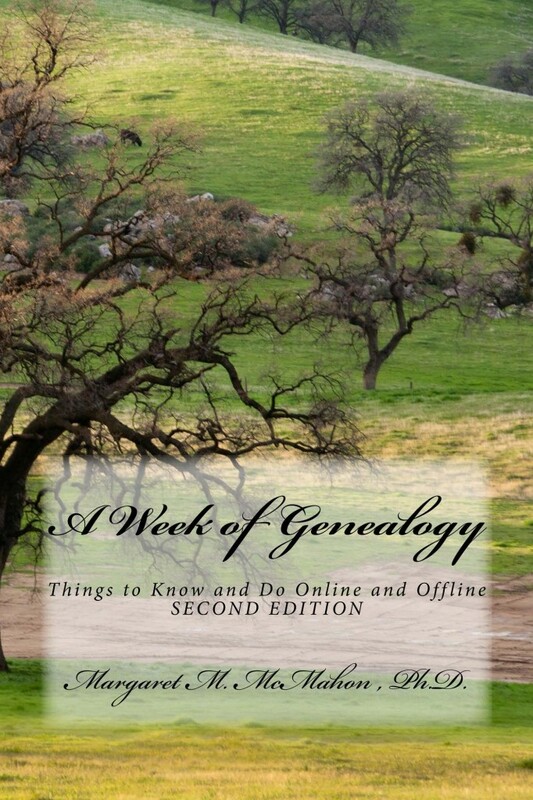 This book covers seven days of genealogical research activities. The book includes things to do before and after the week. The book includes hints, web sites, and search terms useful for all the activities. The web is always her starting place to look for information about her ancestors and their lives. Web pages may contain records, data or the indexes that help locate records at a repository.